MSE-FORKS recently launched its new TRIPLE-FORKS product at the CeMAT intralogistics trade fair in Hannover, Germany. These hydraulic forks can be used where turning circles are extremely critical, e.g. in double-depth warehousing facilities. Telescopic forks usually require a certain overlap (retracted fork length less stroke length). If hydraulic forks did not have this overlap, then the outer sleeve would simply fall off the inner fork when fully extended. 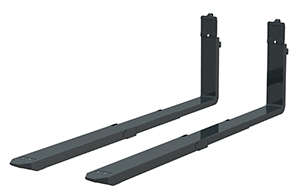 KOOI-REACHFORKS® usually have a minimal overlap of 300 mm, except for our TFG2 model with an overlap of 250 mm. Our new TRG2 TRIPLE-FORKS have an overlap of only 50 mm. 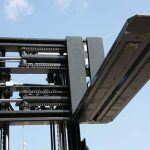 This has been made possible with the use of two extendable outer forks – fitted with an integrated synchronization mechanism. 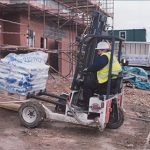 TRIPLE-FORKS can also be used on side loaders where the retracted length of telescopic forks may not extend beyond the platform. They can however be extended to a total length of 1750 mm on a platform with a depth of 900 mm.